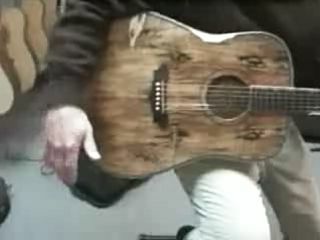 The silhouette of a bearded face has been discovered on a Washburn Dreadnought D46SP acoustic guitar in the Instrumental Music And Sound shop in Ludington, Michigan, USA. The face appears in the body's maple grain just below the bridge and, being bearded, the comparisons to Jesus were inevitable. "I've been here for 27 years and I've never seen anything close to that… the face is so clear," shop employee Jeff Hoyer told the Ludington News. It reminded me, and a couple of other people, of the Shroud of Turin and we know who that was." "It also reminds me of my brother, he's a biker." Mr Hoyer also explained how the guitar's manufacturing process could have caused the anomaly: "It's called book-matching. They take a piece of wood and they saw it down [the middle] and open it up like a book. So what happens is, half of that face is in this [one] half and when they open it up like a book it's a mirror image of the other side of the face." Jesus Christ, Mr Hoyer's biker brother or ZZ Top's Billy Gibbons? There's an appeal for your guesses at the end of the following video. Suffice to say, Instrumental are holding on to the guitar just in case it turns out to be an incarnation of the Son Of God. Or, failing that, an appearance on "eBay" is a strong possibility.